It is a little more challenging to get an accurate picture of trade activity for a particular city or metropolitan area. U.S. Census distributes some information on Metro trade statistics. Other data is distilled from dis-aggregating transactional U.S. Customs data, normalizing the name and identity of the particular importer or exporter on each of their corresponding shipments and thus recording and summing it all up. The results are far from perfect. For one, U.S. Custom data only looks at Waterborne shipments. Thus air, rail and truck shipments are excluded from calculation. Secondly, approximately 1/7 of the manifests have the respective U.S. importer and foreign suppliers names suppressed and are thus invisible. Even more difficult are the tasks of categorizing the shipment under its proper product classification and establishing an accurate valuation. All that having been said, there is still much valuable information to be extracted from the available trade data, as the following charts will demonstrate. Nashville exports for the first half of 2010 exceeded $4.5 billion. $2 billion to APEC and $1.5 billion to its NAFTA partners. The EU and Middle East demonstrated negligible activity. This type of data is available from the International Trade Administration. By using the method described above, individual waterborne shipments can be assigned to the respective exporter along with an estimated value of their shipment. 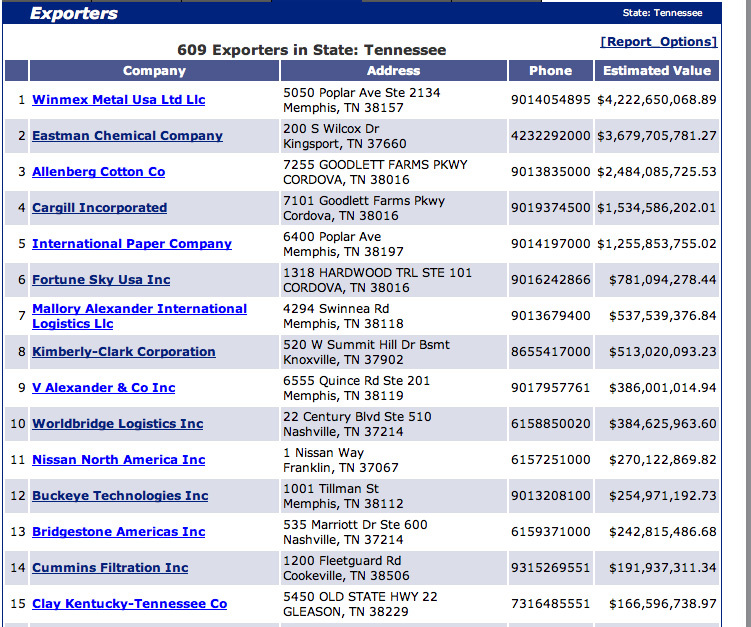 Tennessee has 609 exporters listed. Notice though that many times the NVOCC has been improperly identified as the exporter of record, and thus V Alexander, Mallory Alexander, and WorldBridge Logistics have been listed in the top 15 TN exporters. Further research however, uncovers that many of these (NVOCC) shipments originate from Memphis and deal with TN cotton exports. Tennessee is historically known as a world source for cotton, whiskey and tobacco. Also of note below is Eastman Chemical, one of Tennessee’s longest top exporters. It is located in the rather remote eastern part of the state with an estimated $3.6 billion in exports over the last 12 months. Import transactions are easier to track. For one thing there are over a dozen Trade Intelligence Providers obtaining and disseminating the publicly available U.S. Customs data. On the export side, there is only one company, PIERS, who collects and disseminates transactional export data. This is due to the fact that at the current time Export data has to be gathered by individual (PIERS) representatives stationed at each of the port offices, which is a rather cumbersome and expensive endeavor that no competitor has thus far dared to repeat. Interestingly, Medical Equipment Exports top the list of Tennessee Exports. 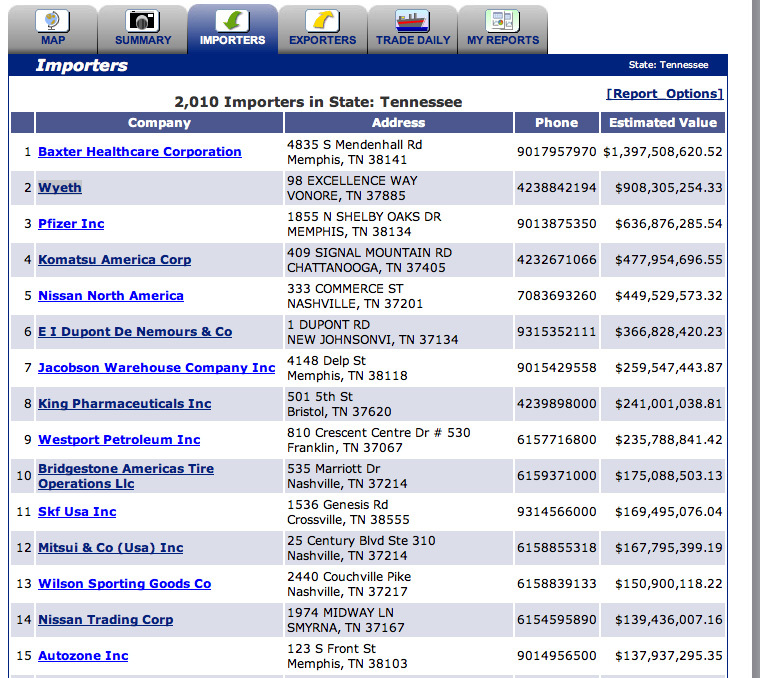 Correspondingly, Baxter Healthcare Corporation is listed as Tennessee’s top importer. Superficially, one might deduce that Baxter is purchasing component parts prior to export of some product or device. However, as a cursory review of the 1,200 import shipments made during the last year reveal, Baxter simply brought up supplies from its subsidiary in Catano, Puerto Rico. For those interested in reviewing a sample of this type of transactional shipment information, available via the U.S. Customs Waterborne Import Manifest (bill of lading) data, you are welcome to download the referenced sample of 1,200 Baxter Healthcare shipments listed on an Excel Spreadsheet. **Any views or opinions presented in this article are solely those of the author and World Trade Daily and do not in any way represent those of UBM Global Trade or PIERS. Some of the trade reports utilized in this article were derived from the PIERS Prospects & StatsPlus applications and are used by permission.